This year Hanukkah will begin at sundown on Sunday Dec. 21st but the annual Hanukkah Family Festival at the Skirball Center will take place on Sunday Dec. 14th. This yearly event offers an entire day of activities for the entire family. For a $10 General admission (children under 12 are Free) the entire family can celebrate the lighting of the candles and remembrance of religious freedom. Activities featured through out the day include Balloon Art, Holiday Storytelling with Bookpals, a Hanukkah Puppet Show and an interactive Hanukkah Play entitled Be A Star! 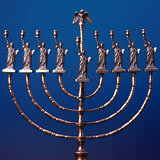 There will also be workshops on Handmade Hanukkah Lamps and Dreidel Game Making. Admission to the festival includes entrance into all exhibitions except Noah’s Ark, which will be closed during the festival.